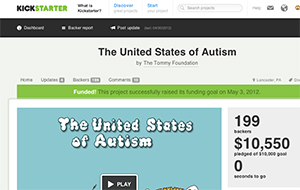 The United States of Autism Kickstarter campaign which brought in almost $10,000 to the producers of the film was featured in a blog post from Autism Labs. Nathan Donnellan had a chance to speak with Executive Producer and Director Richard Everts about his experience in crowdfunding in the autism world. Be sure to check it out if you’re interested in putting together something like this or another project that could use a few thousand dollars!